Zarina Maharaj is the writer/producer/director of the TV docudrama 'Flat 13' written for ETV, a South African TV channel with a global reach through eNCA, it 24-hour news channel. With multiple cinema and TV screenings in South Africa it has also been acclaimed at film festivals. (see Film). 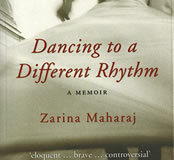 A graduate of the online Professional Program in Screenwriting at UCLA's School of Theater, Film and Television (TFT), and of the Screenwriting bootcamp held in 2017 at the National Film and Television School (NFTS) in the UK, Zarina had earlier authored the award-winning book 'Dancing to a Different Rhythm', reviewed, by among others Nadine Gordimer, a South African Nobel Laureate of Literature - see Memoir - and had written nationally syndicated opinion columns on gender issues for the Independent Newspaper Group - Publications - , while a member of the editing collective of the journal 'Feminist Review'. A dual South African/British citizen of mixed race, Zarina had, prior to obtaining her Masters in Gender and Development from the University of Sussex, obtained a Masters in Mathematics from the University of Nottingham (UK), which she'd applied in industry and academia in the UK, Europe and Africa: in Geneva at the United Nations (UNCTAD), in London at Xerox International, in Maputo, Mozambique at the office of President Samora Machel, on secondment there from the University of Maputo, and in Zambia as a UK government employee with diplomatic status to liaise with the University of Cambridge to 'localise' the Cambridge Examinations System for the Zambian government. It was during this period outside South Africa that Zarina also worked at night in the anti-apartheid ANC's underground movement, within the communications team of the top secret 'Operation Vula', an operation charged by then ANC President Oliver Tambo with infiltrating the exiled ANC leadership back into SA. In post-apartheid South Africa, she was a trustee of the Nelson Mandela Children's Fund while working as a writer and as a consultant to business on women's economic empowerment. For the late President Mandela's views on the role of wives and mothers in the struggle for freedom, see Struggle Days . And for his approach to the abuse of political power and the false allegations of corruption to which Zarina's ex-husband Mac was subjected following President Mandela's term as the first democratically-elected and black president of SA, see Shades of Difference and Abuse of Power . 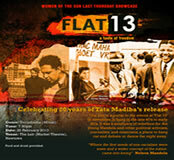 Dancing to a Different Rhythm - a memoir .. more..
Flat 13, made for ETV .. more.. Copyright © 2010, Content - Zarina Maharaj, All rights reserved.